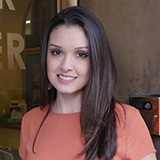 Magaly N. López is a Research Analyst at the UCLA Labor Center. Her expertise stems from experience designing research and evaluation instruments and procedures, executing quality data collection and analysis, and reporting that surfaces meaningful learning and informs future strategy. She has conducted research on Hometown Associations and economic development policy in Mexico, day laborer workforce development in the U.S., construction work in New Orleans post-Katrina, and undocumented children in mixed-status households in New Mexico. She has co-authored and made significant contributions to several publications including: Opening Minds, Opening Doors, Opening Communities: Cities Leading for Immigrant Integration, Rock the (Naturalized) Vote II and Removing Barriers to Postsecondary Success for Undocumented Students in Southern New Mexico. Prior to joining the Labor Center, López was a data analyst at the USC Program on Environmental and Regional Equity (PERE) and the Center for Study of Immigrant Integration (CSII). In this role, she focused her work on immigrant integration and social-movement building and led the California Community Foundation (CCF) Council on Immigrant Integration, a committee designed to build alliances across sectors and tackle policy development in the greater Los Angeles. López was raised running a family-founded Hometown Association and has since continued to find ways to serve her community through a leadership development and higher education prep program in her hometown, Salinas. Currently, she is the Director of the Public Policy and International Affairs (PPIA) Southern California Alumni chapter. López holds a Master’s degree in Public Policy and Bachelor’s degree in International Development Studies and Spanish from UCLA.